Multimedia is media and content that uses a combination of different content forms. It involves a combination of text, image, sound, speech, and video. If a picture tells thousand stories, Multimedia can tell the same in thousand different ways. 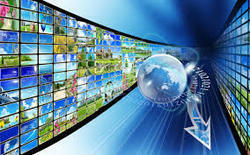 Multimedia enhance the information for better communication and understanding in the most effective and impressive way. It has completely changes the way of communication for the organization and media. Multimedia is the most powerful and appealing way to present the message. Compiling the power of technology with creativity and innovation, Raj Web Solutions provides with user-friendly and interactive multimedia solutions that fulfills your business requirements. Raj Web Solutions is rapidly growing Web Designing and Development Company offering a wide range of services to meet all the Web Designing and Development needs. We provide a lot more to your web site than just coding. We present your ideas in an interesting manner, whatever the topic is.